There are several programs where you will enter a Customer. For example in an Invoice or a Sales Order. The most straight-forward approach is to type in the customer’s name. 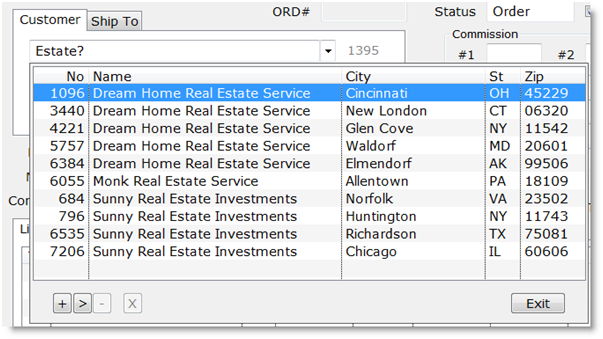 You can press Control-W to open a dropdown list of names, centered on the portion you have typed in. You can also click the disclosure button next to the field, or right-click the field, to get the dropdown. Click on the name you want, or use the arrow keys to highlight the name and press Enter to select it. 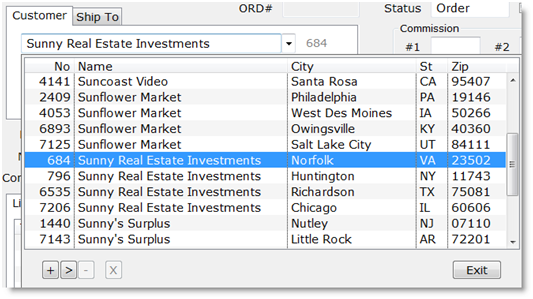 Press Escape or click the Exit button to close the dropdown without making a selection. In the Customer entry field, you can use the Page Up and Page Down keys to scroll through the names alphabetically in the entry field. This can be convenient if you know the name you want is just a few names away from what has autocompleted. For example, if I type in “Sunny” as above, I get customer #684. But I have several customers with this same name. So if the one I want is customer #6535, the dropdown list above shows that it is the third customer with this same name. Pressing Page Down advances to customer #796. Page Down again advances to customer #6535. If you go too far and overshoot the name you want, Page Up moves through the list in the opposite direction. You can type in any part of the name, followed by a question mark, “?”, and press Enter. You will be presented with a dropdown list of matching names. We have modified the number option and added a new one.